The son of a Bookseller, hanged, drawn and quartered at Tyburn. Today I am reading about Edmund Campion 1540-1581, He had a truly amazing life. He changed his faith at a great cost, and he seems to have never backed down or even hid his faith. There are many books on Campion, and more articles on Jstor that I can scroll through. Here are some links to Websites that give a little more basic information on him. “His brilliance attracted the attention of such leading personages as the Earl of Leicester, Robert Cecil, and even Queen Elizabeth. He took the Oath of Supremacy acknowledging Elizabeth head of the church in England and became an Anglican deacon in 1564. Doubts about Protestanism increasingly beset him, and in 1569 he went to Ireland where further study convinced him he had been in error, and he returned to Catholicism. Forced to flee the persecution unleashed on Catholics by the excommunication of Elizabeth by Pope Pius V, he went to Douai, France, where he studied theology, joined the Jesuits, and then went to Brno, Bohemia, the following year for his novitiate. He taught at the college of Prague and in 1578 was ordained there. He and Father Robert Persons were the first Jesuits chosen for the English mission and were sent to England in 1580. His activities among the Catholics, the distribution of his Decem rationes at the University Church in Oxford, and the premature publication of his famous Brag (which he had written to present his case if he was captured) made him the object of one of the most intensive manhunts in English history. He was betrayed at Lyford, near Oxford” Catholic Online. SO, The reason I’m doing all this Campioning, is because, I have a first edition of Campion’s History of the English Church on my book shelf now. In this book,There is an very detailed “Narratio de Divortio Henrici VIII Regis” as well as a History of Wycliff. I will be having a lot more Jesuit books to come this spring! 271G Campion, Edmund. 1540-1581 and Harpsfield, Nicholas, 1519-1575. Gibbons, Richard,; 1550?-1632. Speed, John,; 1552?-1629. Folio, 332 X 210 mm . a4, e4, i4, A-4Z4, 5A-5E4. This copy is bound in original full vellum. Shortly after dawn on July 18, 1581, the cry went out: “I have found the traitors!” With a crowbar the false wall at the head of the stairs was torn away, revealing the huddled figures of Edmund Campion and two companions, three priests lately returned to their native England to minister to those resisting the oppression from the new English Church. Their discovery set them upon the path to martyrdom. Edmund Campion was born on January 25, 1540 into an England of religious and social upheaval. Protestantism had usurped the Catholic Church as the spiritual authority; the dissolution of monasteries and the suppression of Catholic beliefs and believers intensified as land-hungry nobles and men of power continued, in the name of the young, sickly Edward VI, the transformation begun by Henry VIII. Campion was 13 and the most promising scholar at Christ’s Hospital school in London when he was chosen to read an address to Mary Tudor upon her arrival in London as queen in 1553. Campion received a scholarship to Oxford at age 15, and, by the time Elizabeth rose to power (“restoring” Protestantism as the national religion) upon Mary’s death in 1558, he was already a junior fellow. Campion’s Catholic leanings were well-publicized, and he found the atmosphere hostile upon his return to England in 1571. He went abroad to Douay in France, where he was reconciled with the Church and decided to enter the Society of Jesus. He made a pilgrimmage to Rome and journeyed to Prague, where he lived and taught for six years and in 1578 was ordained a Jesuit priest. Campion crossed the English Channel as “Mr. Edmunds,” a jewel dealer. His mission was nearly a short one: At Dover a search was underway for Gabriel Allen, another English Catholic expatriate who was rumored to be returning to England to visit family. Apparently Allen’s description fit Campion also, and he was detained by the mayor of Dover, who planned to send Campion to London. Inexplicably, while waiting for horses for the journey, the mayor changed his mind, and sent “Mr. Edmunds” on his way. Upon reaching London, Campion composed his “Challenge to the Privy Council,” a statement of his mission and an invitation to engage in theological debate (see “Classic Apologetics” in this issue). 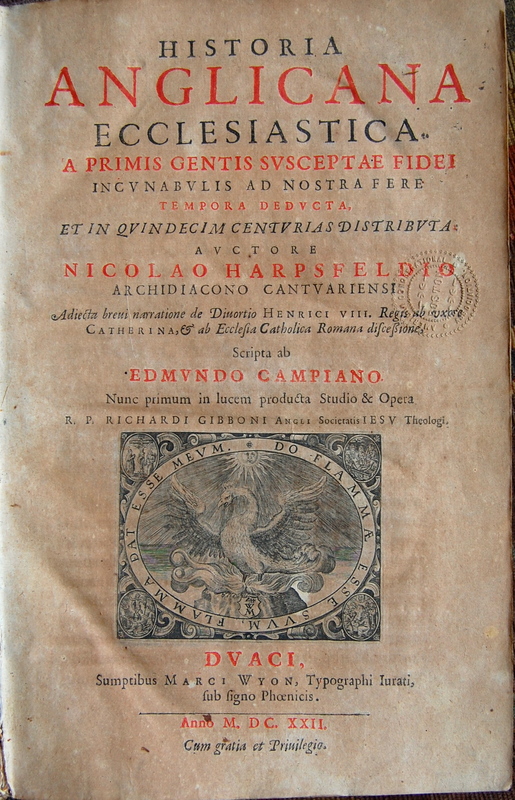 Copies spread quickly, and several replies to the “Challenge” were published by Protestant writers, who attached to it a derogatory title, “Campion’s Brag,” by which it is best known today. The power and sincerity of the “Brag” is accompanied by a degree of naivete: Campion’s statement of purpose was of no value during his later trial for treason, and the challenge to debate, repeated later in his apologetic work <Decem Rationes>, was as much an invitation to capture. And his capture seemed almost inevitable: Elizabeth had spies everywhere searching for priests, the most sought after of whom being her former “diamond of England.” Campion and his companions traveled stealthily through the English countryside in the early summer of 1581, relying on old, landed Catholic families as hosts. They said Mass, heard confession, performed baptisms and marriages, and preached words of encouragement to a people who represented the last generation to confess the faith of a Catholic England. There were close calls. Many homes had hiding places for priests some even had secret chapels and confessionals and the Jesuits had to rely on these more than once. Campion took extraordinary risks, never able to turn down a request to preach or administer the sacraments, and more than once he escaped detection while in a public setting. Later Eliot and Jenkins both claimed to have discovered the priests, offering the same story: A strip of light breaking through a gap in the wall leading to the hiding place was the giveaway both men took credit for noticing it, and each reported being the one to break through the wall. No doubt each sought the credit for capturing the infamous Campion, for no priest was more beloved by the Catholics nor more despised by the crown. On December 1,1581 the prophecy hanging over his door in Prague was fulfilled: Campion was hanged, drawn, and quartered. The poet Henry Walpole was there, and during the quartering some blood from Campion’s entrails splashed on his coat. Walpole was profoundly changed. He went overseas, took orders, and 13 years later met his own martyrdom on English soil. Campion was beatified by Leo XIII in 1886. Quoted from Todd M. Aglialoro . 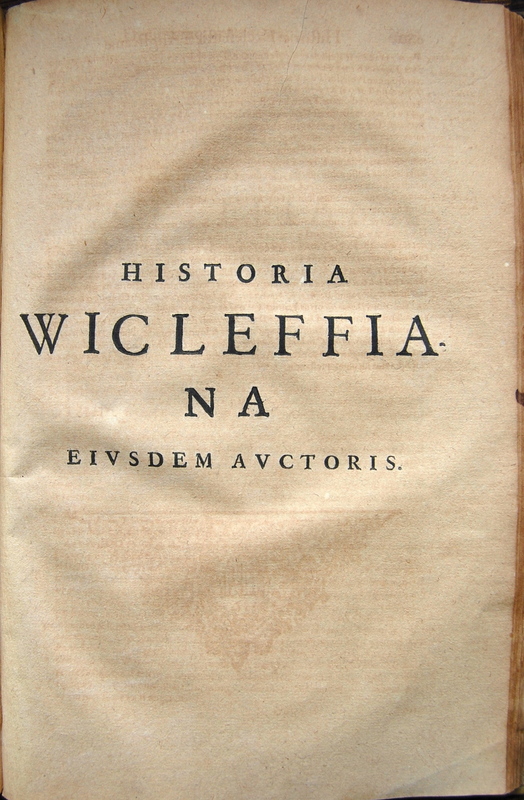 “Historia Wicleffiana eivsdem avctoris”: p. -732./ “Catalogus. Ex Anglico Ioannis Speed Latinva, in quo suo uno aspectu videre est omnium tum monasteriorum …” p. 741-779.